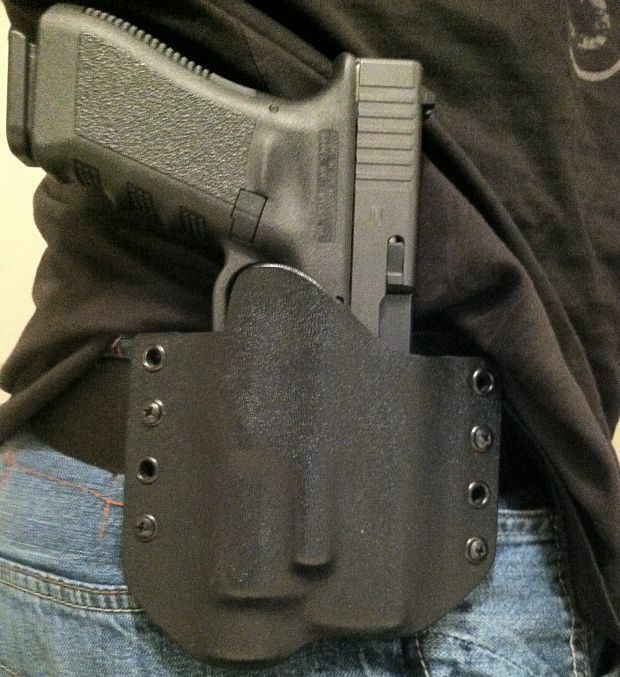 Disruptive Tactical Kydex Holster | STEVEN HILDRETH, JR. This post was originally published on 10 March 2013 on The Arms Guide. I’ve been conceal carrying for a few years now, and one of the most useful things to have for a carry weapon is a weapons light. While most of the time, you won’t need to use it, it works wonders if you happen across a dark room or should you be involved in a self-defense situation in a nighttime environment. The downside is that most holsters won’t accommodate lights, so you either have to draw your pistol, affix your light, and go from there; or, you have to carry a personal flashlight in lieu of a weapon light, something else I have done before. That’s where Kydex comes in. Kydex is a sturdy polymer that can be shaped to fit whatever weapons size is needed. Kydex holsters have risen in popularity due to their reliable passive retention, its durable craftsmanship, and the ability to custom-make it to suit the shooter’s needs. Depending on where you shop, though, the price of the holster will vary. I bought mine from Disruptive Products, Inc. It’s a local store here in Tucson, but they also do online orders. 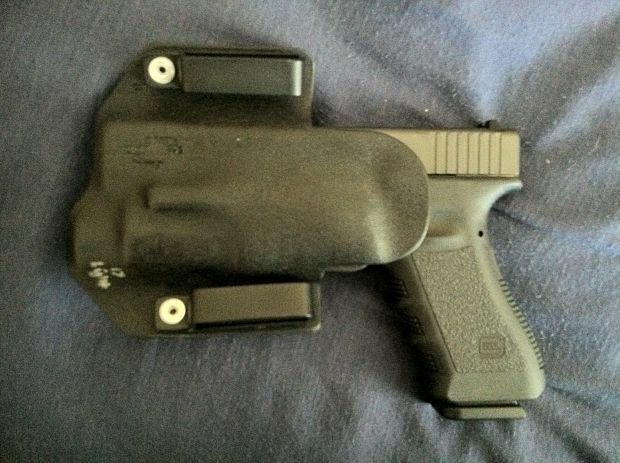 Under their tactical section, they have their Kydex OWB holster that is offered for several popular models, as well as offers the option of the weapons light accommodation (with an additional charge). They can use 1.5″ or 1.75″ width belt loops (mine is a 1.75 since I wear a black rigger’s belt) for your holster, and changing between the two is just a matter of a few screws being turned and lining up the parts how you want them. If your chosen carry piece is a popular model, like the Glock, chances are they already have what you’re looking for in stock. For other models, such as the Smith & Wesson M&P, they may or may not have a holster ready to go and may have to make it from scratch. However, it is worth the wait. These are high-quality holsters designed to withstand a beating and last a long time. Something else I like about it is a feature that comes with any passive retention holster: it makes a draw so much quicker. No thumb bail, no trigger button, nothing but me holding myself up from getting the quickest draw possible. Critics would say that makes it easier for an assailant to relieve me of my weapon, which is a downside. I counter with situational awareness and concealed carry so any would-be assailant won’t know that you have a weapon on your person until the last second. In that case, it will really come down to your personal preference over anything else. All in all, I am very pleased with my selection. The icing on the cake for me was the military discount afforded to me by the Disruptive Crew. 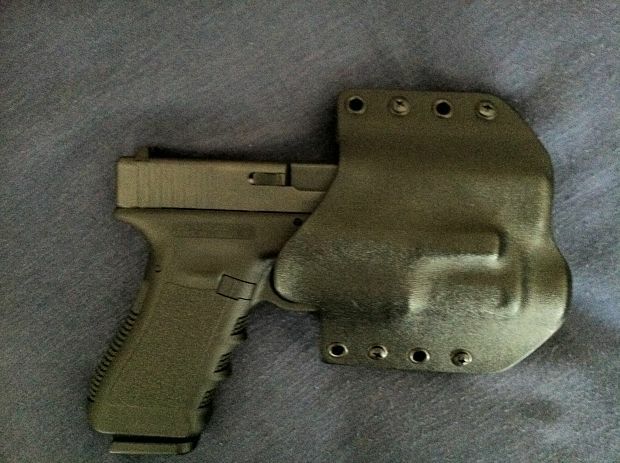 I’ve been carrying this for a few weeks now and have drawn and holstered dozens of times, including some range drills from the draw, and I have nothing but positive things to say about the Disruptive Kydex OWB holster . For somebody considering a weaponlight, or even somebody wanting to look into a Kydex holster, I would definitely point them in this direction.